I, Robot (2016. 235 pages) is a new imprint collection of short stories, written by Issac Asimov in the nineteen forties and fifties and published by the Folio Society. The stories originally appeared in the American pulp magazines, Astounding Science Fiction and Super Science Stories. The collection is important for several reasons, many of them springing from Asimov’s own background and temperament. Writing has rarely paid well, certainly not well enough to have a comfortable life. For every Stephen King or Harlan Ellison there are numerous writers who have to have an alternative career, or in the case of Asimov actually chose their career over their fiction writing. Asimov had whole decades in which he concentrated on his career as a professor of biochemistry and wrote little to nothing new. Prior to Asimov, robots were generally treated as villains to be feared or dumb mechanisms created only for the purpose of serving mankind as a new slave race, in fact the word ‘Robot’ was only a few decades old when Asimov sat down to write his stories having originated in Karel Čapek’s 1920 play, Rossum's Universal Robots which has the robots rising up in rebellion. The laws turned out to be so comprehensive that they remain the basis for any future programming of sentient robots. When the individual stories were collected together Asimov provided a framework for them all to exist in, making them the reminiscences of Susan Calvin the preeminent robopychologist with U.S. Robots and Mechanical Men. Each story is a little puzzle as Asimov attempts to explore the limitations and exceptions to his own three laws, often viewed through the eyes of Calvin who views her charges as more than mere machine. 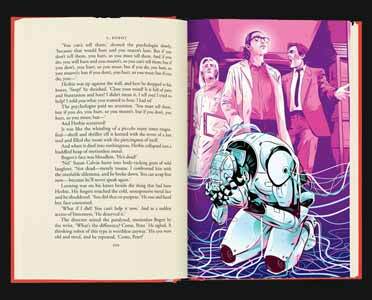 The book consists of the original nine stories beautifully adorned with new illustrations by Brighton based Alex Wells as well as a new preface by Daniel H. Wilson, robotics engineer and author of the highly popular Robopocalypse (2011). As you would imagine from the Folio Society the book is of the highest quality. Contained within its own cardboard protector the predominant colour is red. 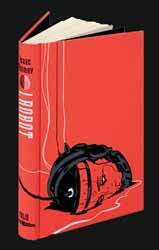 The actual book has an illustration of a severed robotic head, which is less gruesome than it sounds. The stories are printed on good quality paper. Although this is not a new book, the FS have gone to great lengths to make sure that in both quality and presentation, the book should delight any Asimov, or general science fiction fan.